Sanyo Eneloop is the recognized leader in rechargeable battery technology. Now, it appears that the battery giant has improved on their already successful battery design. There’s no doubt that Sanyo Eneloop are the most celebrated and popular NiMH rechargeable batteries in the world today. Partly because of an aggressive campaign and mostyl due to their high level of quality and performance, people who are serious about electronics turn to Sanyo Eneloop for AA and AAA rechargeable batteries. The popularity of the Sanyo Eneloop brand is an impressive feat, considering that the batteries have only been around since 2005. Will Wireless Induction Chargers Replace AA Battery Chargers? Induction Chargers are offering a new kind of charging for wireless devices that use NiMH rechargeable battery technology. But is the technology advanced enough to replace standard AA battery chargers? At first glance, it seems like total magic: new, wireless devices that can be recharged without plugging them in. All you have to do is sit them down on a plastic base and voila! They’re charging. Regardless of how tech-clueless you may be, most people know instinctively that in order to recharge a battery, metal has to touch metal in one way or another. How can energy seemingly pass “through the air” and recharge batteries? Welcome to the world of inductive charging. Some AA battery chargers promise to revive dead, disposable alkaline batteries. but do these battery chargers really work? And are they safe? 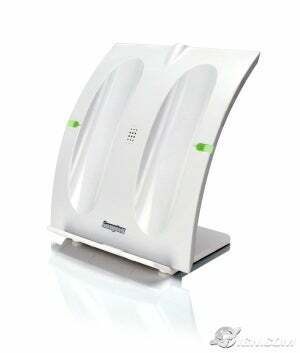 In the world of electronics, smart consumers have to be able to discern between reliable, new technology and gimmicks. As we have pointed out in another article, many electronics accessories turn out to be useless junk that never lives up to the promises of the manufacturer. But what happens when a new electronic device turns out to be dangerous? This is clearly the case when it comes to a new, albeit fringe trend in the battery charger marketplace — the alkaline battery charger. The emergence of the alkaline battery charger has come on over the past decade or so, with manufacturers claiming that their battery chargers can full re-charge disposable AA alkaline batteries. For the most part, these battery chargers have failed to gain mainstream appeal and remain relegated to quirky gadget catalogues for people who seemingly have everything. For a similar price, Energizer, Sanyo Eneloop, and Vapex offer smart battery chargers that offer superior functionality. Many tech-related blogs and online news sources have already weighed in on the Apple battery charger (ourselves included). All in all, very little was agreed upon in the media regarding the advent of Apple becoming a peddler of NiMH rechargeable battery technology: Apple detractors derided the company for apparently re-branding Sanyo Eneloop rechargeable batteries, while others lauded the Apple battery charger as the first truly “green” battery charger on the market. Given the polarizing effect that Apple products have on the tech market, you’re not bound to find much consensus on anything Steve Jobs rolls out, even if it is as lowly as a battery charger. That being said, Apple’s claim about their charger being a “smart battery charger” needs to be challenged a bit, and compared with what constitutes a smart battery charger currently on the market today. There’s no doubt that Apple’s marketing department has sought to characterise their battery charger as a “smart” charger. 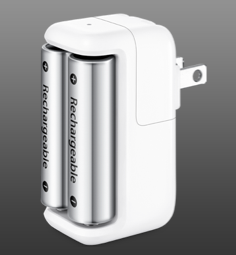 One of their sub-heads on the battery charger page is none other than “The smarter way to charge.” Citing features such as having the lowest “vampire draw” of any other battery charger on the market and the ability to maximise a rechargeable battery’s lifespan, Apple concludes that these features make the Apple battery charger a “smart” charger.